Based on the recommendations of the Ninth Pay Revision Commission, 2010, orders were issued enhancing reimbursement of tuition fees from Rs.400/- to Rs.1000/- per annum, per pupil, to the children, not exceeding two, of Non-Gazetted Officers and Class-IV employees studying in all the classes from LKG to Intermediate / 12th Class, vide reference first read above. The Tenth Pay Revision Commission, 2015, recommended enhancement of the above said reimbursement of tuition fees from Rs.1000/- to Rs.2,500/-. 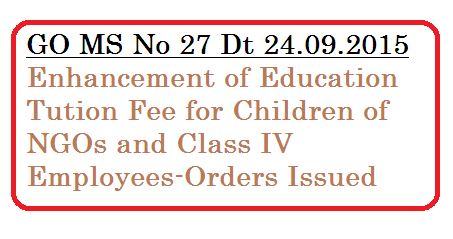 The Government, after careful examination of the matter, and the recommendations of the Tenth Pay Revision Commission, 2015, hereby enhance the reimbursement of tuition fees from Rs.1000/- to Rs.2500/- (Rupees Two Thousand and Five Hundred Only) per annum, per pupil, to the children not exceeding two of all the Class-IV employees and Non-Gazetted officers studying in all the classes from LKG. upto and inclusive of the Intermediate / 12th Class, subject to the other usual conditions regarding the submission of receipts, certificate, etc., as per the existing Rules and Regulations, from the present Academic Year of 2015-2016.